It has been more than a month since I started using products from THE BODY SHOP Himalayan Charcoal line and I am ready to talk about these 2 products and how they worked for my skin, but first I would like to mention that these 2 products were offered to me by Hivency and The Body Shop and this review, like any of my other reviews, is based on my personal experience and all opinions are my own. I already mentioned few things about these 2 products on my Instagram when I started using them -that was about a month ago and I thought would be really great if I would come back with a more detailed review here. The Body Shop formulated a series of vegan facial masks, inspired by traditional beauty remedies all over the world. The Body Shop Himalayan Charcoal Mask is one of them and was made for skin that needs to release impurities and toxins to help reveal a healthy and youthful glow. Himalayan Charcoal Purifying Glow Mask is inspired by Ayurvedic traditions and beauty rituals and it has been made with the finest ingredients- pressed, crushed and blended into highly natural textures to uplift your senses and reveal your skin's healthy -looking glow. 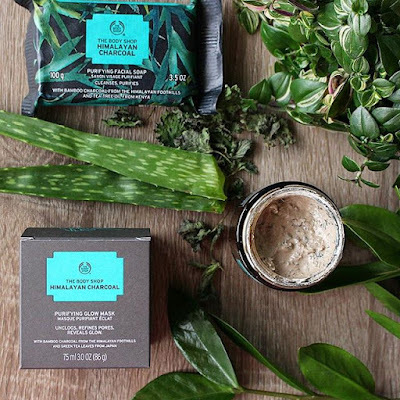 Himalayan Charcoal Purifying Glow Mask is formulated with Kaolin, Moroccan Lava Clay, Bamboo Charcoal, active exfoliating green tea from Japan, Argan oil, Shea butter, Aloe Vera leaf juice, Tea tree leaf oil and Eucaliptus leaf oil. Moroccan Lava Clay has a very long history of use in beauty care. It has been used for over 1,500 years as a soap, (face) cleanser, shampoo and skin conditioner. Due to its unique composition this clay has a high cleaning power and electrostatic force. It binds the excess skin oil and dirt particles. These are then easily washed away with water, leaving the natural protective layer intact, this explain why my skin never got dry from using this mask 4 times a week. Bamboo charcoal from the Himalayan Foothils is known to draw out impurities and excess oils from the skin. The green tea leaves are a really nice addition to this facial mask, loaded with antioxidants and other properties that can fight inflammation and bacteria. Community Trade Tea tree oil from Kenya is known to help skin clear looking, fighting the battle against mild to moderate acne. Because of menthol and the Eucaliptus leaf oil, this mask will give you a tingling sensation so if you feel that dont panic, is also mentioned on the packaging that that the mask is tingling. I would definitely suggest and recommend that you check the ingredient list before you buy this product and make a sensitivity test before applying to the entire face. With my first application I really felt a strong tingling sensation but after the 3rd application the tingling sensation was barely there. After 3 min of having the mask on my face and feeling that intense tingling sensation (the very first time I had the mask on) I thought my skin will be red and irritated but to my surprise when I rinsed the mask off my skin was not red, not sensitive, not dry and not irritated. After first application skin looks deeply cleansed, detoxified, pores appear smaller and tight,skin feels smooth and not dry-these were instant results. Facial after facial my skin texture was more even, my small acne scars are fading and there are barely any new pimples, skin feels smooth and exfoliated, it looks fresh and healthy. The Body Shop suggests that you should use this mask 2-3 times a week. I used it 1 time a week all over my face and up to 4 times on areas where I get hormonal acne (around my chin) or just on spots. It really helps to heal skin and fight against mild acne, or a breakout caused by stress. You can let this mask on your face between 5 and 10 minutes, the mud dries really fast so I usually let it 4-5 minutes but depending on your skin type you can experiment and use it the way that works best for you. I love that it works really good even if I dont let it sit for 10 minutes on my face and you can rinse the mud off really without having to rub it off too much or pull on your skin. This mask comes in a brown jar glass, very cute one- when is empty I am gonna recycle and plant a small cactus in it. There is 75 ml of product in that jar and after a month mine is half empty. I will definitely buy this mask again because is one of the best charcoal purifying facial masks I have used, 100%vegan, its formulated without parabens, silicone, mineral oils and paraffin and also really important cruelty free. Himalayan Charcoal Purifying Facial Soap is very affordable, smells really fresh and it can be used on face. At first I thought this would be a soap bar for body but its actually designed for face and really safe to use it. I was really anxious to use it on my face because I know soap bars can be really harsh for skin and especially for dry skin but things were great, the foam is quite delicate. Skin feels really clean and it removes impurities and dirt. I prefer to use a cream cleanser for my face and I dont think I would continue to use this soap on my face but I am loving it for my body. The reason why I am not going to continue using this soap on my face is because I have dry skin and I think this soap is suitable for normal to combination skin. I have seen online great reviews for this soap from people with oily skin so if you are in that category you might wanna try it. I love to use it on my body, the foam is gentle and quite creamy, it cleans really good, it smells good, it might help with back acne/chest acne if you have any, its really affordable, 100 % vegan, and cruelty free. I have two other masks from the line that I really like, but was hesitant with this one. I have been breaking out after using products with shea butter on my skin, and fear that all the purifying ingredients and menthol on top could be too much. I am planning to buy the one with honey and the one with rose,have you tried them? I also thought menthol was a bit too much here.I am thinking that maybe you could make like a home made clay mask with Moroccan Lava Clay powder (you can get it from clean beauty store) and mix that with liquid raw honey and organic green tea and maybe to that add just a drop of tea tree,I usually use clary sage instead of tea tree because for some reason for me works better and few drops of argan oil and apply this mixture for 10 min on my face 3 days a week.This is what I use for a crazy break out and its always worked amazing for me. ooh i love the body shop face masks. I've tried a few now although not this one, they are really good and do what they say on the tin! I am loving the charcoal trend in beauty/skincare. I've used charcoal face masks before so I will have to try this one next! Is definitely a good trend if I may say so, this mask mask is really doing a great job, hope you like it too !It has such a fresh and reinvigorating smell! My facial skin care is simple - wash, tone, moisturize. I always thought that would be enough since I don't usually wear make up. That was until that time I tried using a facial mask for the first time! I have to try Body Shop's Himalayan Charcoal Purifying Glow Mask and the Bamboo Charcoal Mask. Thanks for the review! Honestly I thought the same,until I tried a few things and my skin transformed and ever since I am a skincare junkie :) Wash-tone-mosturise is still more than a lot of people do! This looks like a great option to add to my skincare regiment. I appreciate you sharing lengthy information about it. Ellen,it means a lot to me that you made time to read it, thanks so much ! I use Himalayan Products and they are very good. Your review is also helpful here because I didn't use this mask yet so now I think I may give it a try. Elizabeth,thank you!I am really happy to hear this was useful for you. I am so happy to hear that you upped your skin care routine ! I also love how fresh and natural everything from The Body Shop smells. I'm a huge fan of The Body Shop. Those two products you mentioned sound yummy for my skin. I need to go visit their shop again soon! I use quite a few of the mask and currently have this one and have yet to try it. These winter months I should be using more items since my skin is very sensitive & dry! If your skin is dry you should skip this mask and try the rose one or the one with Ethiopian honey.Those are going to do wanders for your skin an for an extra boost of hydration try their new sheet mask is absolutely amazing and also biodegradable !